OneCreativeCat: 3rd times the charm? 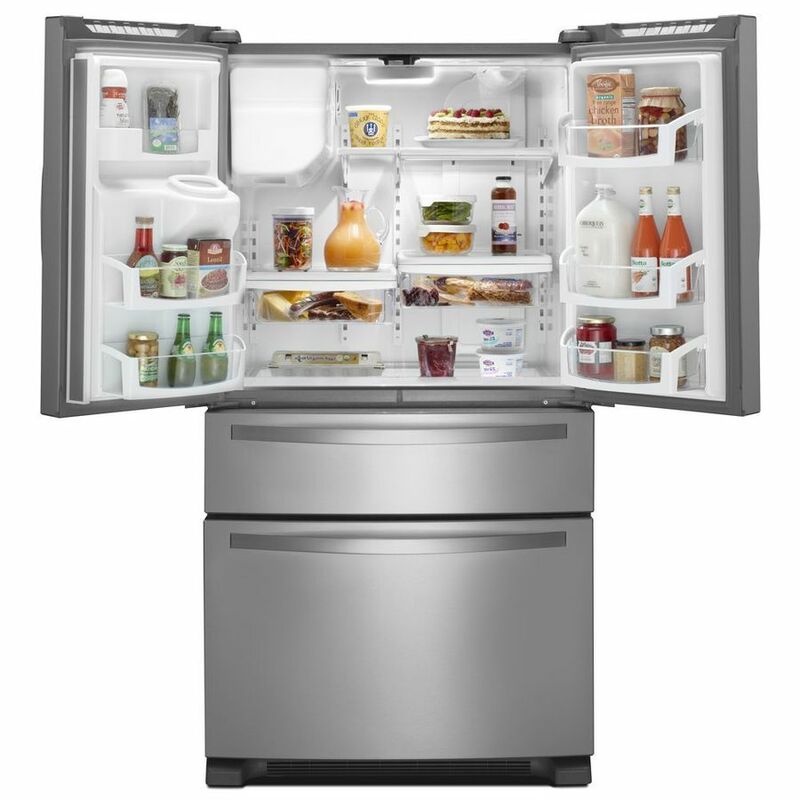 I am trying to get a new refrigerator, sounds easy right? Well, when you have a tiny galley kitchen and the ice box has to be next to a wall, your pickings are slim to none! 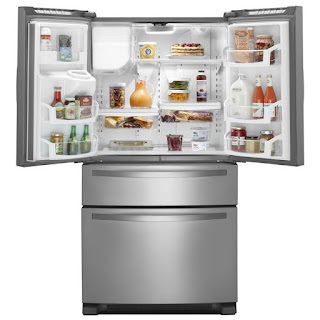 I want a fridge that has ice and water in the door, I can't deal with no ice this summer, I use so much ice that my current fridge can't keep up. And with water in the door maybe we can cut down on buying bottled water. 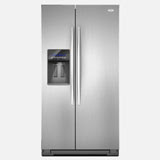 I went to Lowe's and picked out a fridge, they delivered it and it was not 30 inches deep it was 48 inches deep, UGH! Ok, back to Lowe's had to buy a new one from them, and have them pick up and refund me for the wrong one. Got the new fridge delivered but when you opened the right side door you could not access the drawers due to the right door can only open about 87 degrees due to being against the wall. Wrong type can't use next to a wall! Hoping this will work next to the wall after I move the drawers to the left. It has ice and water in the left door. 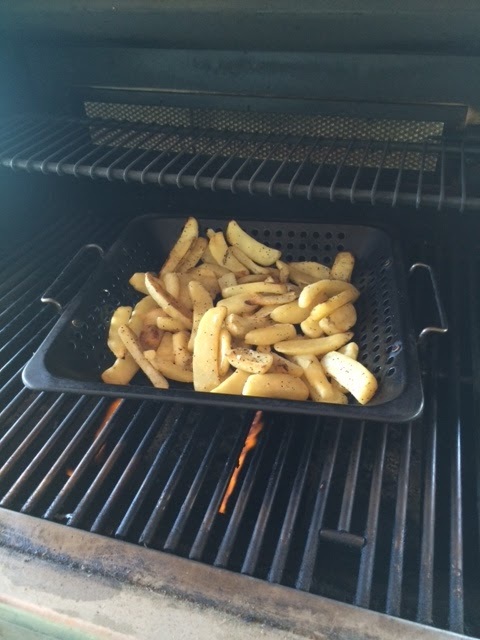 In other news, I discovered that we can cook french fries on the grill!! We wanted some burgers and I made our favorites, Pub Style Angus Burgers from Sam's choice, they are soooo good, located in the freezer section. Try them, they are great! 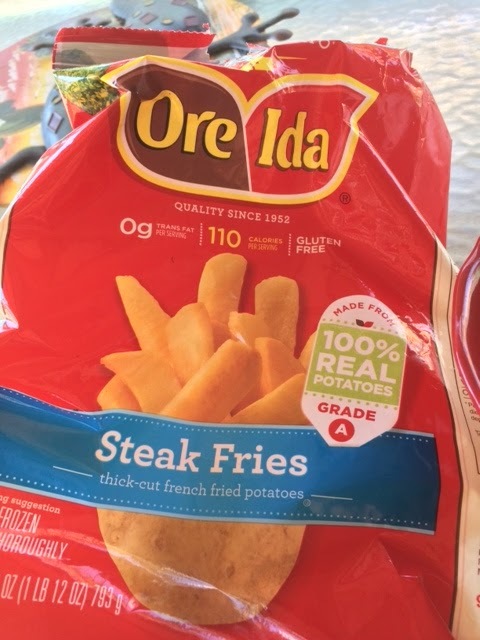 So I grab a bag of fries and decide to throw them in the pan I cook veggies in on the grill, I shook them around and let them cook until golden brown and done, Wow, worked great! Who Knew?? So there you are, a fun little grilling secret on how to serve fries at your next BBQ. I have been reading and watching youtube videos so I can really make some wonderful foods on the grill, I have a book called How to Grill by Steven Raichelen. 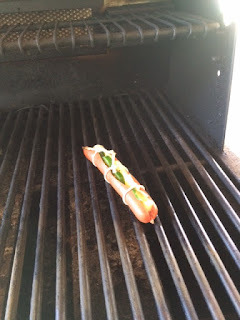 He has a really great Hot Dog recipe for the grill....I tried it out and Holy Smokes, I don't think I can go back to eating plain old dogs on the grill anymore! 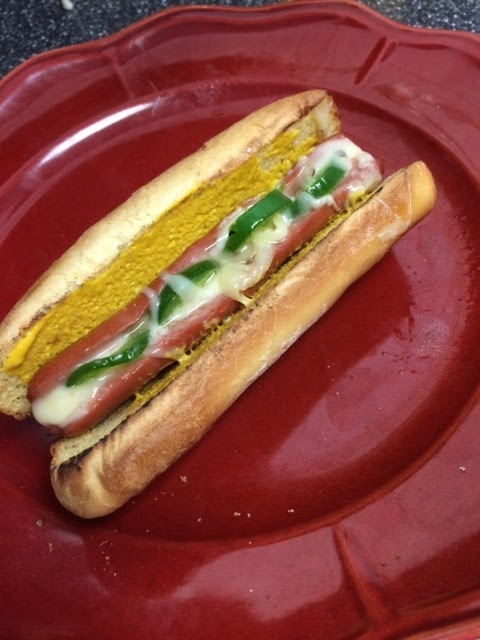 You cut a v shaped wedge out of the dog, lay in some cheese, I used pepper jack and some sliced jalapenos and tie up with butcher string, I really did not need the string so if you are careful you might be able to get away without using it. just cook and tilt and cook and tilt until done, Oh Yummy! Toast the bun and add some mustard, it was very good! I hope you are enjoying your summer, we had our 11 year old grandson for 10 days and had so much fun playing in the pool and grilling up some great food. See you soon with more recipes from my grill!